Horses typically eat hay that's grown locally, which means their options are often restricted to what grows best in their area. While alfalfa is considered an ideal hay, horses can also eat timothy, clover and tall fescue hays as well as mixtures of these hays. No matter what the variety of hay they eat, hay that retains its green color is preferable to yellow hay, and clean hay is a priority. Legume hays, such as alfalfa, clover, and soybean hays, are generally nutrient-rich. They may have higher calorie, protein and calcium content than other hays. Legume hay may also offer nutrients that are more digestible than other hays and may be too rich for many horses. For this reason, legume hays are often mixed with grass hays. Legume hays harvested before the plant begins to blossom have the best taste and are the most nutrient dense. Small grain hays include oats and pearl millet, as well as cereal grain hays from barley, wheat or rye. 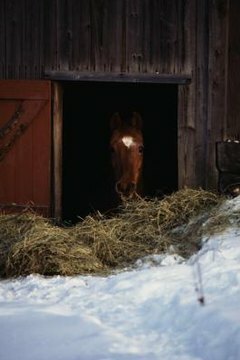 These kinds of hay offer horses a significant amount of carbohydrates through the sugars and starches they provide, although they are not as dense in calories as legume hays. In addition, small grain hays do not offer as much potassium as legume hays or grass hays. Small grain hays may have higher nitrate levels than legume hays or grass hays. Because horses can tolerate no more than 2 percent nitrates in their diets, small-grain hays require testing for nitrate levels prior to feeding. Grass hays, such as tall fescue, timothy, or orchard grass, only offer a low to medium amount of protein to your horse. These hays also fail to provide a sufficient amount of calcium if they are fed by themselves. Ideally, you should feed these hays in combination with a legume hay. Grass hays are highly palatable and are high in fiber, despite not being high in nutrients. Tall fescue hay is not appropriate for pregnant mares, as it may lead to stillbirths and abortions. Moldy or dusty hay can actually harm your horse’s health. It can cause upper respiratory infections and ailments. Moldy hay can cause the heaves, a chronic lung diseases. It can also cause colic, a serious and often fatal condition. While hay stored outside can be fine if it’s sun-bleached to a light yellow, brown hay is often moldy. It is best to assess the color of the hay at the center of a bale to determine freshness: Mold is often found on the inside of a hay bale rather than on the outside. Clean hay should be free of dirt and trash and mostly free of weeds.